Netflix’s Master of None released its second season in May, once again earning reams of critical praise and enthusiasm for its thoughtful approach to storytelling. On June 5, fans gathered at LACMA’s Bing Theater in Los Angeles to watch two episodes from the new season—“New York, I Love You” and “Thanksgiving”—at a special Film Independent at LACMA screening event. The episodes were followed by an entertaining and insightful conversation moderated by Film Independent at LACMA curator Elvis Mitchell with creator/actor/star Aziz Ansari, co-creator Alan Yang, actor/writer Lena Waithe, director Melina Matsoukas and writer Aniz Ansari. One aspect of the new season that Mitchell singled out for praise was the show’s soundtrack. Much recognition was given to Zach Cowie, a music supervisor for the show, whom the panel said had a huge vinyl record collection—the result of having working in the music industry for a long, long time. Viewers can easily be filled with nostalgia while watching the “Thanksgiving” episode in particular, as its time-hopping flashback structure allowed for the inclusion of numerous old-school hip-hop jams. Mitchell asked Matsoukas how she was able to craft each era as its own distinct period—essentially six different stories with six different entry points. Matsoukas said she wanted the episode to evolve through the years (and ears) right down to the hair, makeup, clothes, art direction and cinematography. Camera filters were used to enhance the vision. And for the “Thanksgiving” episode especially, the writers agreed that they couldn’t write that particular story alone. Waithe came in to co-write and give her perspective while also acting, which contributed to the overall success of the episode, one of the second season’s most highly praised. The episode charts Waithe’s character’s coming out—a journey mirrored by the actor’s own experience. Aziz said they don’t consciously try to make each episode of Master of None different from the one before. They look at each episode on its own and ask themselves “What can we do stylistically to enhance what that story is about?” The premiere “Thieves” episode was homage to the classic 1949 Italian film Bicycle Thieves, so the creative choice was made to shoot the episode in black and white. Colors were added to the second episode because they wanted to reflect the vibrancy of the Tuscany region of Italy. The structure of the “First Date” episode was crafted in a way that led to each date changing in and out—depicting several encounters as if they were part of the same contiguous narrative. “With each thing, it was really just trying to figure out what we can do to make it feel different, but also stylistically feel part of the whole,” Aziz said. Aziz also said that it’s hard to do the show and not feel like its falling into a pattern. The show took a long break following its first season; when the creators came back they were determined not to let the show fall into predictability. Yang and Aziz said that what drove them was the desire to be different, with Ansari stating that fear is what makes people fall back old routines, templates and patterns—something they hoped to avoid. “People of color communicating in American sign language is revolutionary,” Mitchell observed. 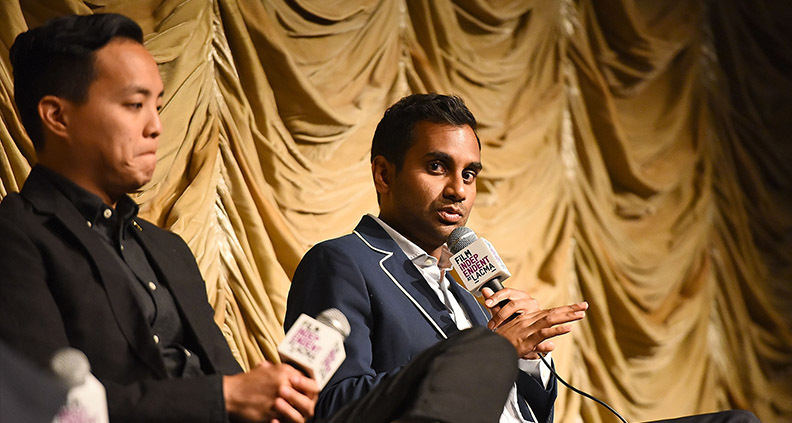 Aziz humbly claimed that the show isn’t trying to make any progressive statement other than using their own experiences to make art, and that Master of None’s creative decisions aren’t political (as some interviewers have asked). Even the title of the fictitious movie in the “New York” episode, Death Castle, was randomly chosen with no particular meaning behind it, except that it sounded funny. Fun fact: Andy Samberg voices Nicholas Cage in Death Castle. When they reached out to Cage they received a quick “no”—an anecdote that prompted a rupture of Cage impersonations across the panel. Mitchell asked the team if there was a particular moment when they realized that this new season of Master of None was something different and special. 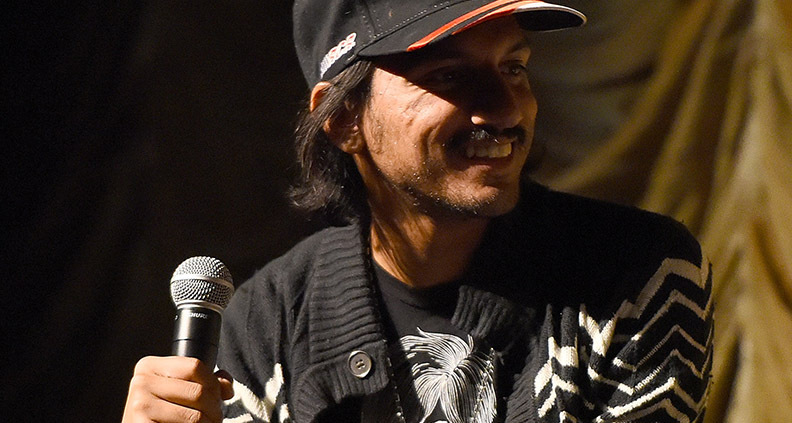 Aniz said the moment for him was when they were filming “New York, I Love You.” All the characters in the episode have different stories, but they connect to each other in the end by watching movies together. “We just wanted to write our experiences and hopefully people will find some commonalities,” Aniz said. To learn more about upcoming Film Independent at LACMA events—just click here. Not a Member of Film Independent yet? Become one today. 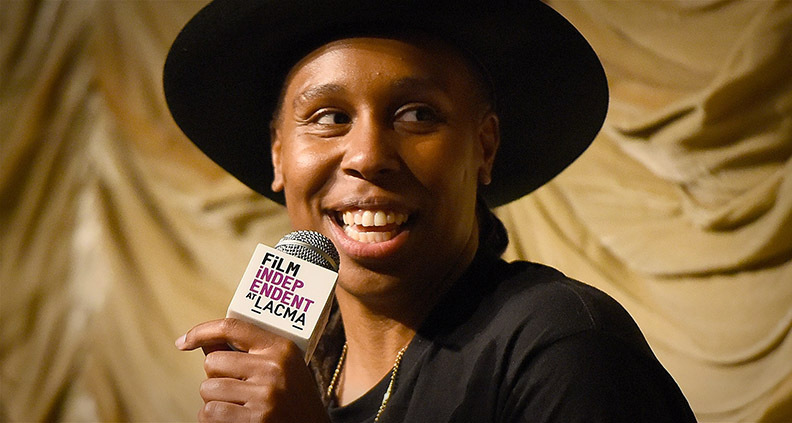 If you want to catch more of Lena Waithe, she will be the keynote speaker at this weekend’’ Diversity Speaks panels during the LA Film Festival. More info here.